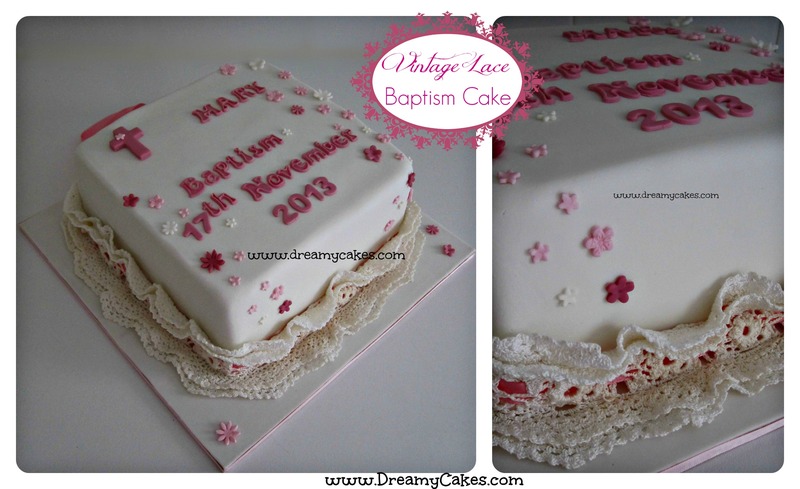 Christening Cakes – ideas for Baptisms, Christenings, Naming Ceremonies and Blessings. Christening, Baptism or Naming Ceremony – whatever you choose for your child you’ll want it to be a very special celebration; one which brings together friends and family to celebrate a milestone in your child’s life. 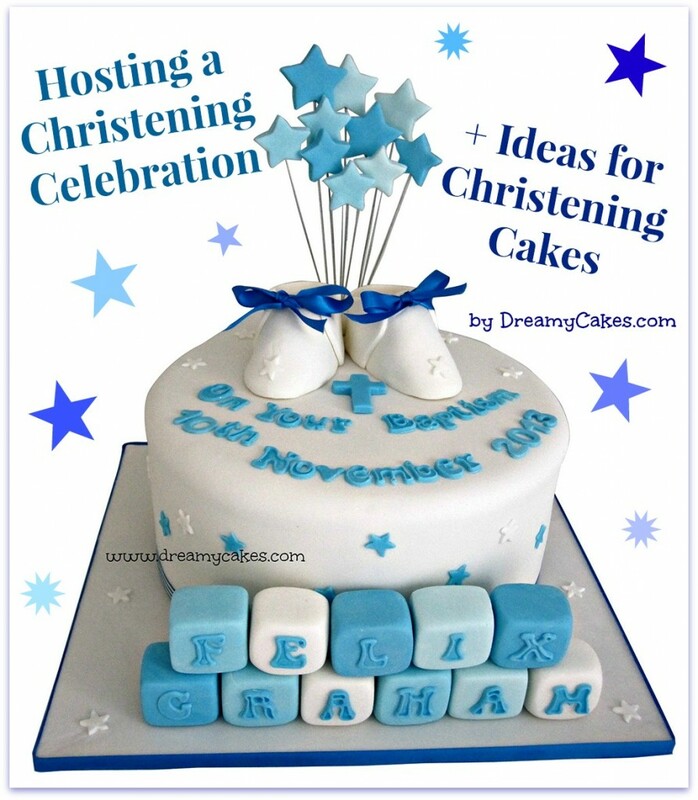 In this post we’ll give you some ideas on how to organise a Christening celebration including invitations, venues, food, bomboniere and of course Christening Cakes. After the actual ceremony, some type of gathering, party or reception usually follows. 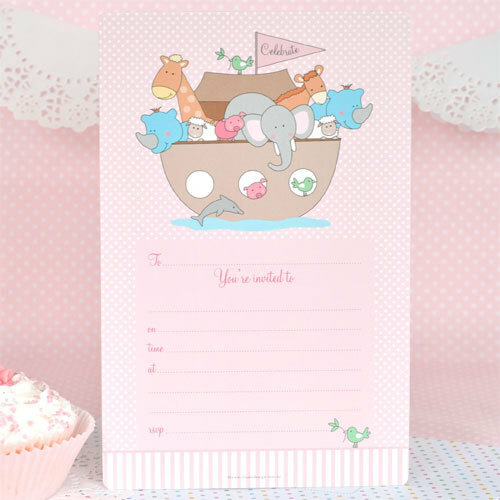 They come in pink and blue and also have a full range of matching party items like cups, plates, gift tags etc. We love that you can purchase just the invitations or the whole shebang! – great if you have a large back yard or entertaining area. – there are some beautiful local parks to hold the party. As a minimum, search for a venue with a covered shelter large enough to hold the number of guests that will be attending, a playground (if there will be children attending), toilet facilities close by and easy car parking for your guests. – if you don’t want the hassle of holding something at home a local restaurant is a good option and there is no need to worry about a wet weather back up plan. – if you have a generous friend or close relative who kindly offers their own home – this can save the budget and is also less stress for mum and dad to organise the party at their own house. – some Churches have an adjoining Church hall or function room along with kitchen facilities too. This makes for an easy transition from the ceremony to the party with no additional travel. 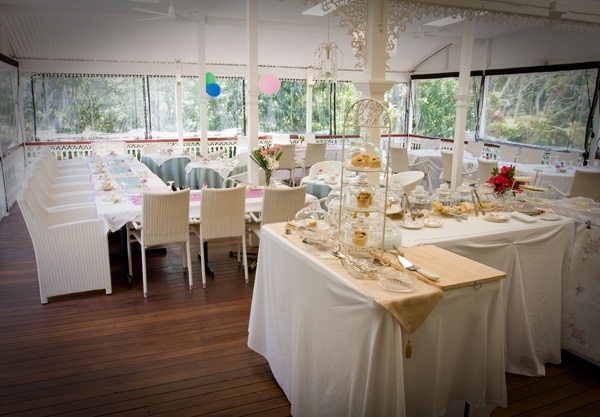 – if you are anticipating a large number of guests, hiring a function room in a hotel or function centre may be a good option and you can leave the washing up for someone else when the party is finished. – for a smaller event, a cafe is the ideal venue – perfect if you are wanting to serve a morning or afternoon tea to your guests. 2. 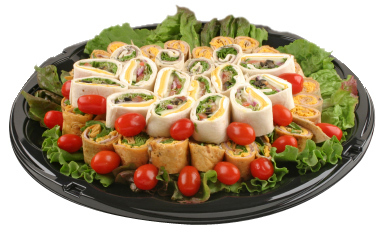 Sandwich platters – you can make them up yourself or order them from a caterer, local sandwich shop or carvery. Sandwiches don’t have to be boring…think bagels, pita bread or croissants for something a bit more elegant. 3. Deli meats and salads – sliced, cold BBQ chickens or deli meats and serve with an array of salads and crunchy bread rolls. Easy and delicious. 4. Sushi Platter – pre-order lots of different platters from your favourite restaurant. 5. 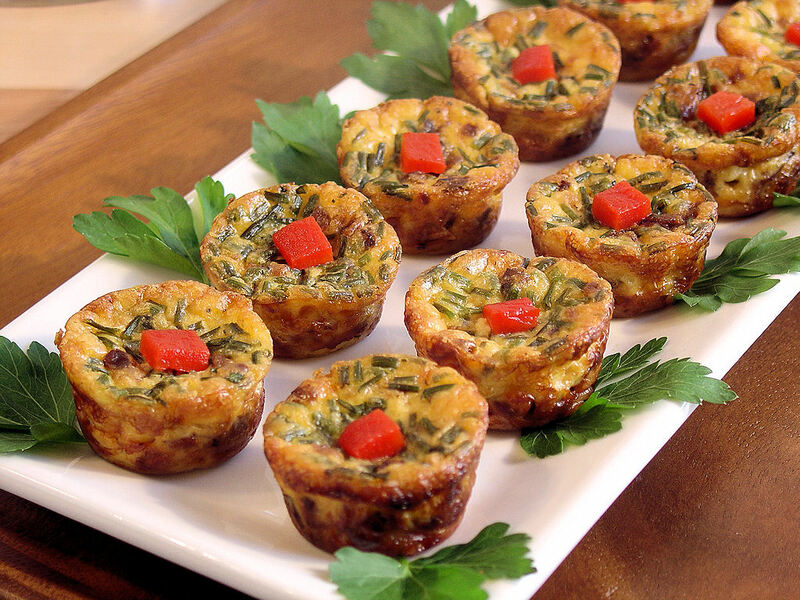 Finger foods – such as mini quiches, sliced fritatta, savoury tartlets along with cheese and fruit platters are easy to put together yourself – have them pre-made and wrapped in cling wrap ready to serve. 6. Cake and coffee – large, catering-sized sheet cakes served with tea and coffee is an easy option for a shorter, informal gathering. 7. Lolly buffet – for the sweets lovers, a fashionable lolly buffet is a fun idea and guests will love the novelty of selecting from so many beautiful lollies. Accompany the buffet with fruit punch and homemade lemonade. Kelly Beans Bomboniere is a local Brisbane business offering a range of different bomboniere options. 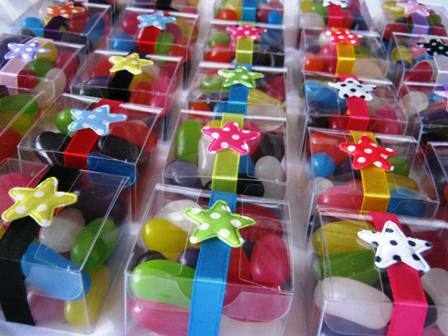 We love these Jelly Bean Gift Boxes which you can match to your party theme and colours. They also offer empty jars and boxes so you can D.I.Y if you are on more of a budget. And these beautiful little paper booties from Small Fry & Co. would make a cute gift if you are craft-minded and prefer to make your own. 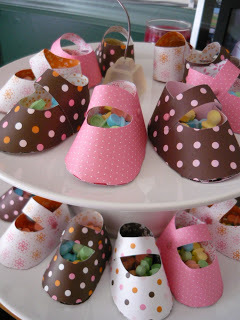 You can fill them with lollies, chocolates or traditional sugar almonds. Match the paper to your chosen theme for a co-ordinated look. You’ll find a pattern for these paper booties on their website. 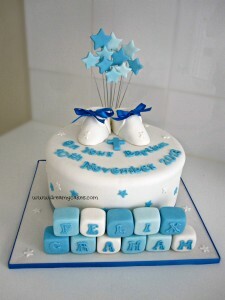 Christening cakes are the centrepiece of the celebration. Whether you would like a novelty cake or more of a traditional design, the options are endless. 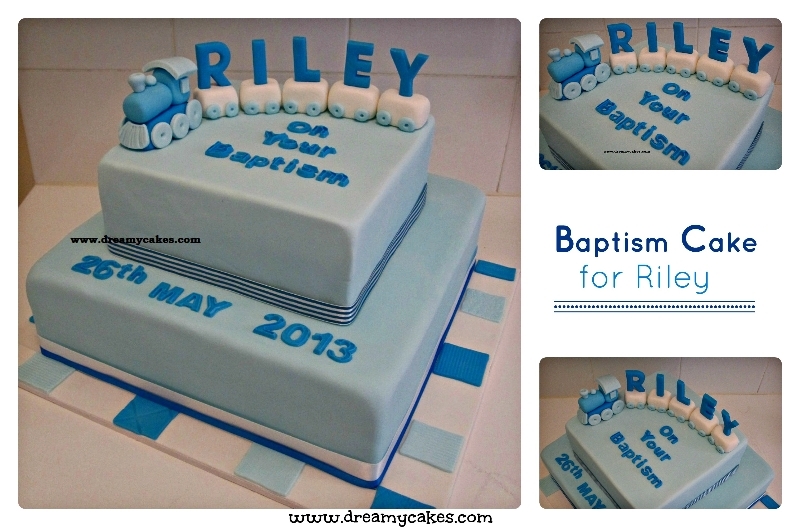 Popular themes for Christening cakes include teddy bears, baby blocks (spelling the child’s name), sugar booties to Elephants, Owls and Noah’s Ark. 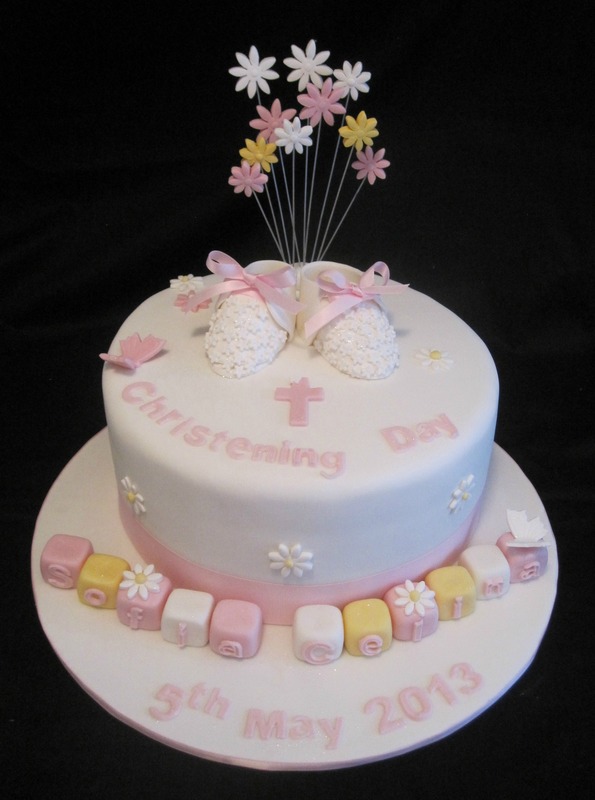 Most of the Christening cakes you see here can be created to suit a girl or a boy. 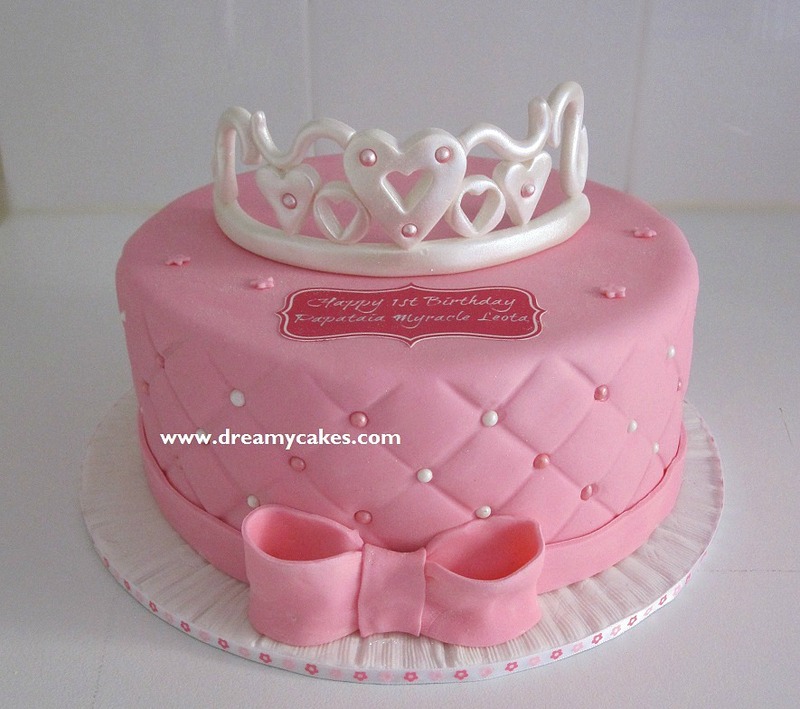 Quilted fondant and a handmade sugar tiara make this a special cake for any little princess. This design looks fantastic by itself or as a topper cake for a cupcake stand. 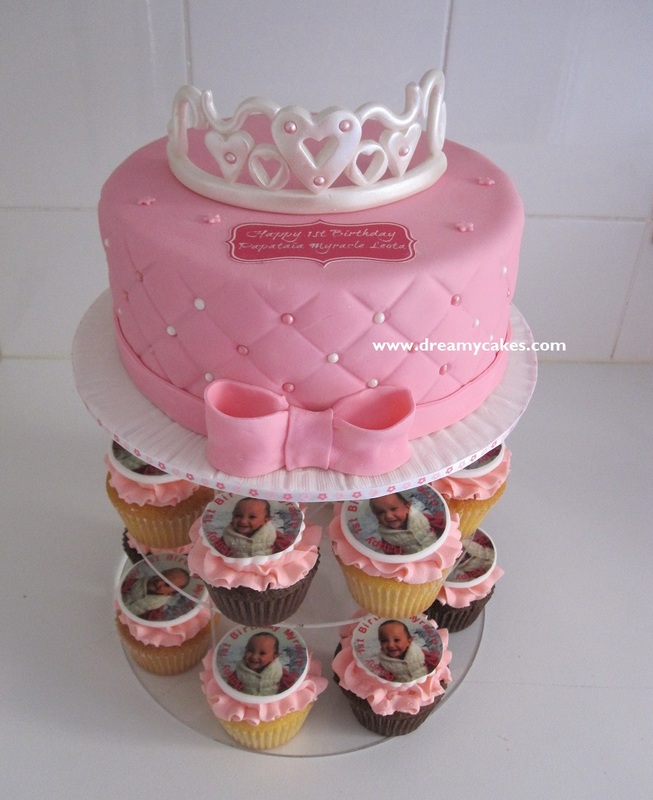 Cupcakes are an easy-to-serve option for Christening Cakes. Your guests can enjoy them at the party with their coffee or take them home as a thank you.